A subdued Westfalenstadion was the setting for Dortmund vs Augsburg as the second Bundesliga Monday night fixture this season was met with disapproval from the stands. A lacklustre display from both sides saw the points shared on a night to forget. Marco Reus opened the scoring in the 16th minute. A deflated Dortmund side ran out of ideas in the second half. Kevin Danso blasted the ball home from close range to steal a point for the visitors. The action on the pitch was almost as passive as the atmosphere off it. 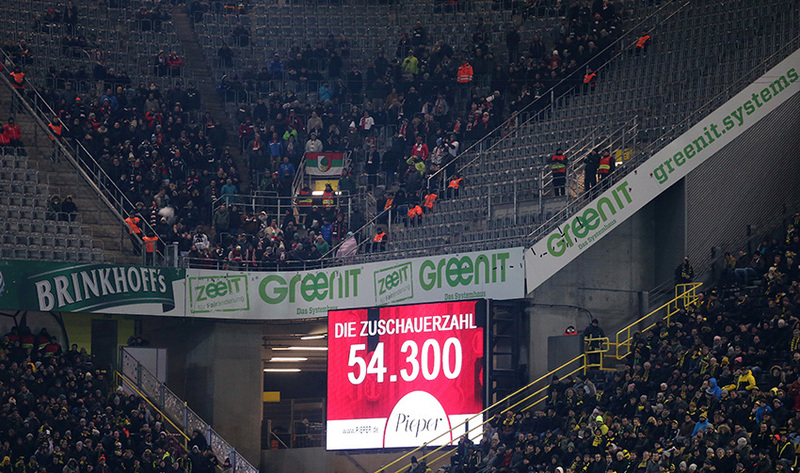 Dortmund normally welcome 83’000 fans to a home fixture but Mondays are unpopular in Germany – and the Dortmund fans showed exactly how unpopular, over 29’000 boycotted the game in a show of disapproval to the scheduling of fixtures outside the traditional weekend slots. This, in turn, affected the rhythm and pace of the players on it, the fixture had all the feel of a pre-season friendly. 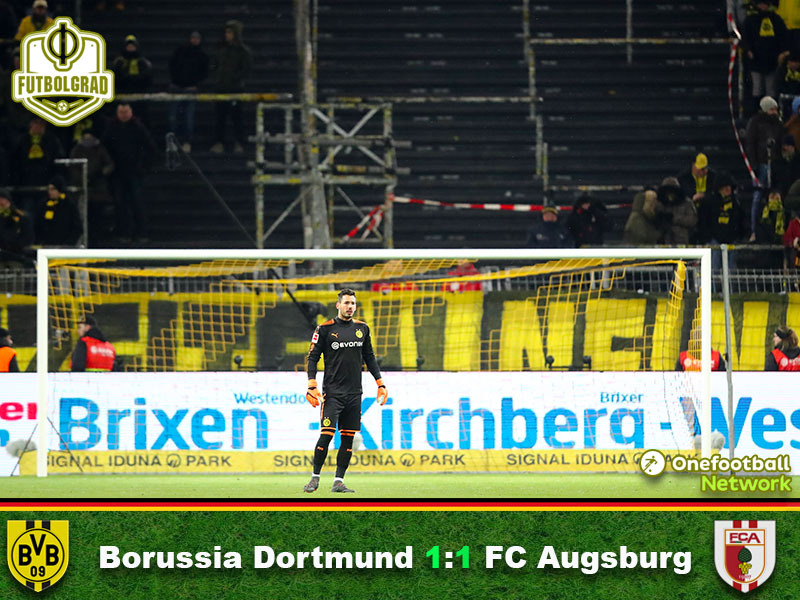 Apart from a flash of inspiration from Augsburg’s Michael Gregoritsch, Dortmund and Roman Bürki had little to worry about for the opening 45 minutes. For their own part, the hosts were happy to play the ball around patiently. When the Schwarz-Gelben finally decided to venture into third gear on 16 minutes it resulted in the opening goal. A Mario Götze – Andre Schürrle combination finished by Marco Reus, the forward grabbed his second goal in two games since returning from a long-term knee injury. The remainder of the half was a combination of a different kind – Dortmund and possession versus Augsburg and retreat. If the first half had the feeling of a friendly fixture, then the second was defined by Dortmund’s friendliness to allow their visitors to attack. Barely out of second gear for the opening 45 minutes, the hosts dropped down to first gear as the hour mark passed. Had Augsburg been able to muster any sort of finishing ability they could have easily embarrassed their hosts on a larger scale. Gregoritsch was a thorn in Dortmund’s side as the second half dragged on. The Austrian first saw his cross flash along the face of the goal before he had a genuine penalty shout turned down after a clumsy coming together with Ömer Toprak. It felt for a time that the Yellow and Blacks were just about clinging on in a fixture that shouldn’t have really threatened them. The recently prolific Michy Batshuayi had a torrid night. Feeding off over hit passes and a lack of appreciation from his teammates the striker was unable to pull himself into the game. As the 70th minute passed Dortmund had registered an unfathomable one shot on target. In a game of little quality that statistic was to be telling. From their third corner of the night, Augsburg levelled the scoreline. Kevin Danso jumped the highest to steer the ball goalwards, Bürki was equal to the chance pulling off a reactionary save but the rebound fell back to a grateful Danso, the defender blasted the ball into the net – it was the very least the visitors deserved. In a game that lacked any real quality from either side the only contributors worthy of a mention were both goal scorers. Marco Reus and Kevin Danso, the only two players to inject any sort of enjoyment into a dowdy affair that was more akin to a training match than a top-flight fixture – poor. The boycott of this fixture, by almost 30’000 spectators, once again underlined that Monday night fixtures are not a welcome addition by those who frequent the terraces in Germany. With Dortmund and Augsburg fans following the precedent set last week in Frankfurt, the protests against this Monday night fixture will have embarrassed the DFL – especially as the game was broadcast worldwide. Augsburg remain eighth in the Bundesliga table thanks to Kevin Danso’s equaliser. Marco Reus claims his second goal in two games.